VERSACE coat and pants, VALENTINO sweater, BOTTEGA VENETA boots, DAVID YURMAN necklace, and PORTRAIT REPORT earrings. HERMÉS sweater, shirt, pants, and boots, PORTRAIT REPORT earrings, and BITTERSWEET rings. KENZO vest and pants, BOTTEGA VENETA shirt, THURSDAY BOOT CO. boots and ROCKING AGE necklace. HUGO jacket, VALENTINO shirt and pants, OFF-WHITE C/O VIRGIL ABLOH boots, ROCKING AGE necklace, and talent’s own belt. BOTTEGA VENETA jacket, VALENTINO pants, THE KOOPLES shirt, GIUSEPPE ZANOTTI boots, and talent’s own jewelry. ALEXANDER MCQUEEN blazer and pants, ERMENEGILDO ZEGNA COUTURE shirt, THURSDAY BOOT CO. boots, DAVID YURMAN rings, and PORTRAIT REPORT jewelry. LOUIS VUITTON sweater, pants and shoes and talent’s own jewelry. ERMENEGILDO ZEGNA COUTURE jacket and pants, VALENTINO sweater, and BEN SHERMAN boots. ERMENEGILDO ZEGNA COUTURE jacket, HERMÉS shirt, TOPMAN pants, THURSDAY BOOT CO. boots and DAVID YURMAN necklace. TOPMAN blazer and pants, KENZO shirt, THURSDAY BOOT CO. boots, and PORTRAIT REPORT earrings. Left to right: HANES t-shirt and LOUIS VUITTON pants and boots. HANES t-shirt, TOPMAN pants, and THURSDAY BOOT CO. boots. HANES t-shirt, ALEXANDER MCQUEEN pants, and PORTRAIT REPORT earrings. HANES t-shirt, VERSACE pants, BOTTEGA VENETA boots, and DAVID YURMAN necklace. HANES t-shirt, VALENTINO pants, GIUSEPPE ZANOTTI boots, and talent’s own jewelry. HANES t-shirt, HERMÈS pants and boots, and PORTRAIT REPORT earrings. HANES t-shirt and LOUIS VUITTON pants. HANES t-shirt, TOPMAN pants, and THURSDAY BOOT CO. boots. HANES t-shirt, VALENTINO pants, OFF-WHITE C/O VIRGIL ABLOH boots, and talent’s own belt and jewelry. 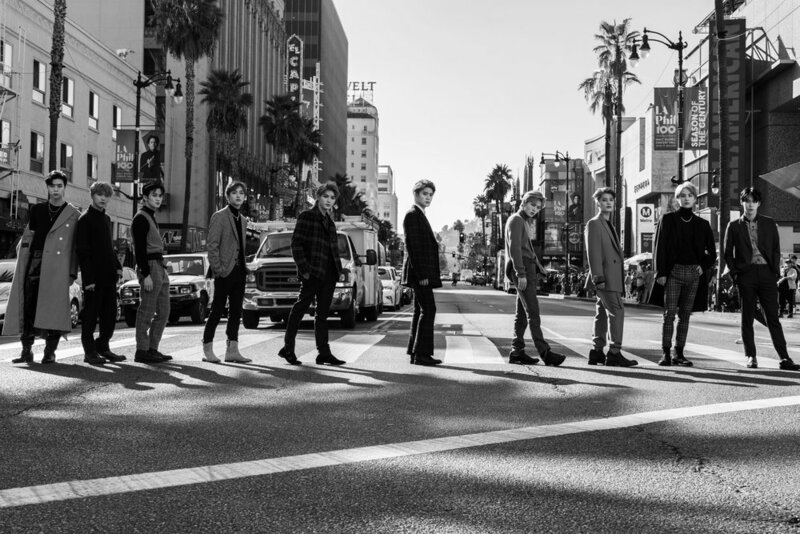 Ten beautiful [redacted] boys stand in Hollywood’s crosswalk, posed as The Beatles. Still as statues, they do not acknowledge the red man. The light turns green. They do not move. Car horns blare. The 13-year-old girl’s screams grow louder. (After learning she loves them so much she followed them here from South Korea, it occurs to me just how much anxiety this scene must have given her.) I get the idea she might take her own life if one of these boys is run over by an impatient LA driver. Together, the ten boys are NCT 127, a Seoul-based K-pop group Rolling Stone called “2018’s K-Pop Artist to Watch,” the LA Times declared to be “leading the next generation of K-pop,” and iTunes reports is “Up Next.” They were recently invited to the American Music Awards, which will go down as the group’s first red carpet event. The aforementioned 13-year-old from above is one of approximately 15 South Korean teenagers who follow NCT 127 around the world. Joining them on Hollywood is a herd of Angeleno K-pop fanatics. Left to right: Johnny wears BOTTEGA VENETA sweater, VERSACE pants, and his own earring. Haechan wears BALDWIN sweater and pants and PORTRAIT REPORT earring and HERMÈS pants. I ask one why she’s so enamored with this group. “Have you seen them?” she spits back. “No!” It sounds like she could cry. “They’re so talented.” I notice one of them crying quietly. She smiles at my bewilderment. “Welcome to K-pop,” she says. I’m assuming most people need an introduction. I certainly did. So, a brief history of K-pop. A man named Lee Soo-man founds an entertainment group called SM Entertainment, inspired in large part by the popularity of early MTV programming. A few years later, noticing the immense success of South Korea’s first counterculture boy group—Seo Taiji and Boys—Lee decides to put a group together himself. They—H.O.T.—achieve immense success.When South Korea’s economy suffers in 1997, its government follows Lee’s suit; this is to say, it cashes in on counterculture by calling it Culture and selling it. K-pop is born. NCT 127 is one of 38 groups and artists that SM Entertainment owns. Its members are part of an umbrella group called NCT, a conceptual pop collective unique in the fact each of its subgroups considers themselves to be part of the same larger project, unlimited by typical constraints like geography or language. There’s NCT Dream, NCT U, NCT China, and a couple others, all of which are organized according to age or location. Left to Right: Mark wears his own jacket, shirt, and pants. WinWin wears BOTTEGA VENETA sweater, VALENTINO pants, PORTRAIT REPORT earring, and his own belt. The Future of Culture Technology! As a company that produces the best in cultural content and entertainers by using state-of-the-art cultural technologies, SM Entertainment aims to touch the people’s hearts and promote Korean culture in every corner of the world with the goal of contributing to national economic growth and a more affluent life for everyone. It is not the concept that is foreign; it is the articulation of the concept. American popular culture shies away from language that exposes cultural commodification. Labels like Columbia or Disney’s Hollywood Records (or even indie labels like Domino or Sub Pop) try just as hard as their South Korean counterparts to breed fame and commercial success. The main difference: American executives codify their language, which effectively distracts people from the piles of money just beyond eyesight. They speak of success in terms of individuality, vision, genius, etc. The massive teams that contribute to this artistry—label executives, PR people, even producers—are cloaked in fine print. Left to right: Taeyong wears VERSACE shirt, KENZO t-shirt, VALENTINO pants, and his own jewelry. Jaehyun wears BEN SHERMAN jacket, CALVIN KLEIN t-shirt, ALEXANDER MCQUEEN pants, and his own jewelry. I want to be very clear about this: I am not saying K-pop idols—as they are called—possess less genius than American pop stars. It is rather that they (read: their teams) do not obscure from public awareness the machinery fueling their idols’ careers; they include it in their literal mission statement. The idols themselves are open about it. “‘Neo Culture Technology’ means that our music, messaging, and culture can be spread throughout the world through culture technology trends.” This is NCT 127’s Jungwoo. I know from his KProfile on KProfile. com that he is a Pisces, weighs 128lbs, and is blood type AB. Now you might be wondering: What are culture technology trends? Or maybe: Messaging? SM Entertainment uses a related term—digital convergence—in describing their vision for transmitting Korean Culture to a global audience. The vision is essentially to capitalize on the unprecedented success of the music video for PSY’s “Gangnam Style,” which remains the 3rd most watched video of all time on YouTube. Jungwoo wears TOPMAN sweater and pants and HANES t-shirt. Doyoung wears his own clothing. “We all love music and dreamt of performing on stage. Our music itself is great, but what really makes us stand out are our performances,” explains Doyoung (Aquarius, 133lbs, B). As Taeyong (Cancer, 128lbs, O) puts it, “The best part of it all is that we get to showcase the music we love to the world. We all work hard so that we can perform on bigger stages in the future. I can’t really think of anything that’s hard about being in a K-pop group; we all do this because we love it.” Watching NCT 127’s music videos and live performances, it is abundantly clear they speak the truth. You must watch them, any of them. They are unbelievable. This is (currently) what cultural technology trends look like: impressive, big budget music videos transmitted through YouTube technology. As for messaging, I am honestly unsure. All I know is that whatever Jungwoo means, I am about it. In light of the fact NCT 127 is so open about the idol industry’s bureaucracy, their love for the music they make feels more genuine than is possible for an American pop star. When Johnny (Aquarius, 149lbs, B) says, “We share in our dreams and become one through music. That’s our core message,” I know just what he means. It affects me deeply—I want them to win. They are winning. K-pop is winning. NCT 127 is ranked 3rd on Billboard’s Social 50—above Justin Bieber, Rihanna, everyone except One Direction’s Louie Tomlinson and fellow idol group, BTS. This chart’s ranking is determined by how many followers/likes/friends/views/streams a celebrity account receives, mapping it over time. Out of the top ten spots, idol groups hold six. No matter how hard I pushed, her answer remained the same. The only thing that changed was the smile spreading across her face.